Thank you for helping NCI to provide the pediatric research community with a valuable resource for identifying and locating genomic datasets that can be used to further our understanding of childhood cancers and develop better treatment protocols for sick children. We appreciate your contribution to this inventory! 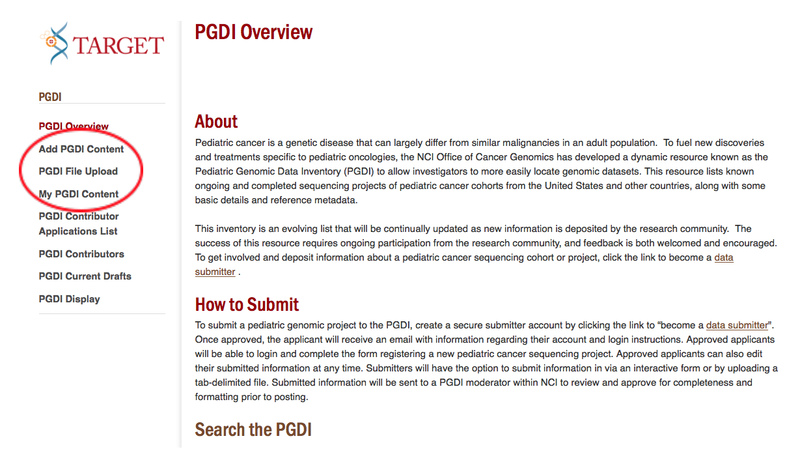 To become a Data Contributor to the Pediatric Genomic Data Inventory (PGDI), visit https://ocg.cancer.gov/programs/target/pgdi/overview and click on “PGDI Contributor Application”. 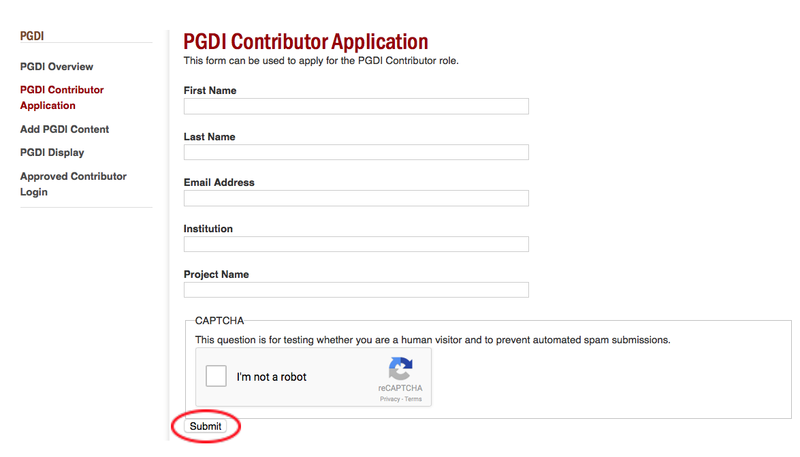 Each PGDI Data Contributor will need to register for security purposes by completing all required fields on the application page, including CAPTCHA (Completely Automated Public Turing Test to Tell Computers and Humans Apart) test confirmation. Once all fields have been filled, click “Submit”. You will receive detailed login instructions once a secure account has been created. Note: Contributors will need to provide an email address from their institution or register with their NIHEXT email account. No personal email accounts. If you do not receive an email with the detailed login instructions, check your junk mail. The login page can be accessed from the PGDI Overview page by clicking on “Approved Contributor Login” in the left-hand navigation. Note: When logging in for the first time, you will be required to change your password. In the event you forget your password, a new password can be requested from the “Approved Contributor Login” page by clicking the “Request A New Password” tab. The options located in the left-hand navigation allow you to add project content to the PDGI, you can either a) add a single project through an online fillable form by clicking “Add PGDI Content”, or b) upload a completed template file with a single or multiple pediatric genomic projects by clicking “PGDI File Upload”.) Note: All submissions, complete or partial, should be saved at the end of each login session. You will have the option to view any previously saved partial or complete submissions by clicking “My PGDI Content”. 4. a) Clicking on the “Add PGDI Content” link will take you to an online fillable data entry form where you will be prompted to enter information for a single disease project. There are six broad categories to describe each project, which can be completed across one or multiple sessions. When finished entering information using the online form, click “Save” and you will be directed back to the PGDI Overview page. Note: NCI requests that cohorts incorporating multiple cancer types be entered into PGDI as separate “projects”. A downloadable template is available to use in this instance if that would be preferred. 4. b) Clicking on the “PGDI File Upload” allows you to download the template file (.xls) to fill in individual or multiple pediatric genomic projects. Please separate information by disease cohorts (i.e. one disease cohort per row is preferred). To upload a completed tab-delimited file containing pediatric genomic project entries, click on “PGDI File Upload”. Once on the correct page, click on “Choose File” to locate the file on your local device, click “Upload” and then “Submit”. The file will be checked for errors before final import to the PGDI project and added to the PGDI display page. 5. You can view the current and any previous submissions through the “My PGDI Content” page located in the left-hand navigation menu. From this page, you can view any content you have created and the current status of draft or published. In the event you are unable to finish a submission, your work will be saved as a “Draft”. You may complete your “Draft” of the online fillable data entry form or view content that has already been submitted by selecting “Published”.